According to primary whistle blower Benhur Luy, Janette Napoles, aka the Pork Barrel Queen, was wont to say, “hawak ko ang gubyerno.” Any of us can make a similar claim, in jest or when delusional, but Napoles was not far from the truth each time she said that, in boast to be sure. To what degree and how extensive her influence has reached inside the corridors of power is what the country is witnessing right now; and for starters, if we go by who have been charged with conspiring with her thus far, it would seem to include the highest officials of the land. Janette Napoles is at the center of the latest corruption scandal to hit the country, a scandal that precipitated the unprecedented “million people march in Luneta” that included opposing groups that would never have been seen in the same rally in the past. Filipinos are notorious for their inability to unite for or against almost anything, but the gravity of the “pork barrel scam” and the widespread involvement of what looks like a majority of both houses of Congress, past and present, provided the impetus for the temporary alliance of various political factions. Meanwhile, the pork barrel expose has taken a life of its own and has “given birth” to what seems like an endless number of other related issues including bribery of senator/judges by no less than PNoy and his top cabinet officials for a guilty verdict. And prior to that, the “incentive” for the Congressmen to sign, without first reading, much less, verifying (a constitutional requirement), the impeachment charges hurled against the former CJ that eventually got him booted out from office. The President, having been with the legislature for 12 years, knows the dynamics of the pork barrel including the kickbacks made by the legislators, either from his own personal experience or as witness to it during his 12 years in Congress. Even the janitor in Congress is aware of it. The alleged bribery is not only crooked for the act of bribery in itself but abominable because it implicitly condones the thievery of the legislators via kickbacks on their allocations, whether DAP or PDAF. The administration – the President — has the power to withhold the allocation, expedite it, delay it, and can even increase it. That explains why congressmen join the political party of every new president that moves into Malacanang. 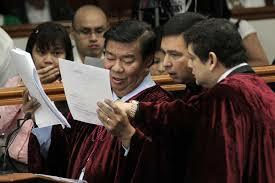 In Congress it’s called: “go where the pork flows.” And the response from the palace is: “be our guest but here’s our request.” And that “request” could be the impeachment of the chief justice, constitutional provisions notwithstanding. Soon, it will be Christmas day and another new year to celebrate, and with it, a renewed hope for the best for ourselves, our families, and our country. Unfortunately, hope alone does not bring about reforms, and we seem to be looking at all the wrong places when calling out for change; we look and point at every which way but the mirror. No wonder. So the next time you get pulled over by that notorious neighborhood cop for the illegal-turn you just made, don’t ready to give to him a 100 peso bill, or the laminated and signed calling card of the Horrorable Mayor Kurap Ako Jr. that you keep in your wallet. Just run over “Mamang Police” and speed off. That’s a change from the bribery you’ve been practicing all your life. The neighborhood would be the better for it anyway without that cretin around.